Los Angeles Dodgers left-hander Ryu Hyun-jin has suffered his first loss of spring training. 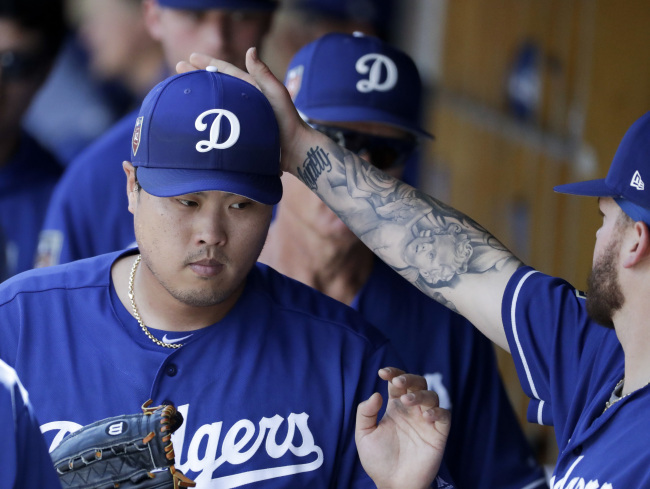 Ryu allowed five runs on seven hits in just three innings against the Chicago White Sox in their spring training game at Camelback Ranch in Glendale, Arizona, on Saturday. The South Korean pitcher walked two and struck out two, while making 62 pitches. Ryu left the game with his team down 5-0. The Dodgers got two runs back in the top fourth but couldn’t generate more offense in a 5-2 loss. In his previous start last Sunday, Ryu gave up four runs in 2 2/3 innings against the Colorado Rockies. During the previous week, Ryu faced the Chicago White Sox minor leaguers in the unofficial “B” game and gave up a run in 2 2/3 innings. Ryu is now sporting a 14.29 ERA for the spring. He’s still expected to be in the Dodgers starting rotation behind Clayton Kershaw, Rich Hill, Alex Wood and Kenta Maeda. Ryu is entering the final season of his six-year, $36 million contract. Ryu is tinkering with his repertoire this spring, trying to add a two-seam fastball to the mix and increase the spin rate of his curveball. But he struggled with his command against the White Sox on Sunday and needed 24 pitches just to get out of the first inning. He issued a leadoff walk to Yoan Moncada on a 3-2 two-seamer, and Moncada later came around to score Chicago’s first run on Avisail Garcia’s groundout. Ryan Cordell’s grounder brought in another run, and Tim Anderson‘s double made it 3-0 White Sox in the opening frame. Ryu allowed an infield single with one out in the second inning. He had a chance to get out of the inning unscathed, as Moncada hit a grounder to second baseman Jake Peter. But the Dodgers infield failed to complete what would have been an inning-ending double play, and the White Sox made them pay, as Garcia doubled to left center for a 4-0 lead. Jose Abreu then brought Garcia home with a single up the middle, putting the White Sox ahead 5-0. Ryu had his only scoreless inning in the third, as he worked around a leadoff single by Anderson.